Table talkers are a widely-used promotional product, often seen on the tables and in the waiting rooms of restaurants, spas, and health-care facilities. Despite their popularity, many businesses may think that table talkers aren’t right for their industry. However, with improved printing technology and a more creative outlook, table talkers can be an interesting and new way to boost your marketing efforts. Quality printing in St. Louis can help any business transform their standard marketing materials into something fresh and out of the ordinary. Here’s how you can create your own unique table talkers that will help you become the talk of St. Louis. Table talkers are sometimes referred to as boredom busters, because they’re usually placed in areas where people are waiting. That’s why they are so often seen on restaurant tables and in the waiting rooms of medical facilities; people are bored and eager for a distraction. The goal for businesses is to create a boredom buster worth reading. Table talkers, when created properly, can be effective in selling the reader on your business or product. When people are bored, it is much easier to command their attention. Eye-catching graphics and photos, bold and colorful fonts, and a distinct personal style make table talkers instantly noticeable. Take the opportunity to talk about any special promotions, provide valuable information about your product, services, or company, and to encourage readers to act by following you on social media, signing up for your newsletter, or taking advantage of a limited-time offer. With a heavy duty, 30-mil plastic material and high-gloss finish, your plastic table talkers are sure to be both durable and command attention. No matter what talker size your business needs, the surface area is generous in its dimensions. Thanks to numerous shape options, you can even print images on multiple sides, depending on the product. An important image becomes more noticeable when passersby see the display from various angles. Placing talkers on a prominent table near a sitting area is one way to persuade someone to take a closer look. This doesn’t mean those passing by on foot can’t enjoy the graphical details. Enough space is available so that relevant messages are still readable from several feet away. 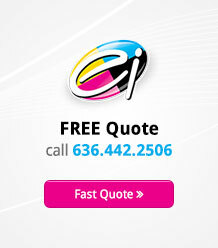 Commercial printing makes graphics and colors look brighter, so they better capture busy people walking by. High-definition photographs transfer especially well on the plastic material and can provide a sense of realism and detail to the piece. When the talker has to compete with other nearby media (like magazines or TV monitors), improved clarity of graphics can persuade people to engage. 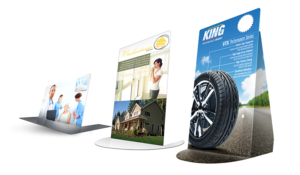 Many companies may not realize that table talkers can take on a variety of shapes and sizes. Horizontal and vertical options are the most common surface area variations, but they can also be shaped to accentuate a particular image and make your table talker really stand out. For creative examples, a medical facility for cardiac patients could shape the table talkers into a heart. A restaurant could make the piece look like a popular piece of food. A retail store could turn the talker into the outlined shape of a new product they wish to promote. With custom sizing, a business has ample space to elaborate on a complex service or new product, or to highlight multiple products on one talker. For those providing very specialized services, larger table talkers can be a more efficient way to convey a lengthier message. Adding interactive elements to table talkers is a creative and effective way to encourage readers to act while you have their attention. Giving the viewer more of an incentive to read, or even incorporating other media to enrich the information, can really bust the boredom (and even the anxiety) of a waiting-room experience. One example of this is making a website URL plainly visible so that someone can instantly learn more about your business, check out your blog, or shop your products. Creating a connection between a physical promotional piece and someone’s smartphone opens a gateway into their digital world and inspires a more engaged customer response. Similar results are possible by printing QR codes on your table talkers. The interactivity is more direct here because of the smartphone scanning process. Evidence shows QR codes are a superior marketing tool for all businesses, since it can showcase videos, coupons, or downloads. A quality barcode on your table talker can urge potential customers to act right away. Table talkers can be quite versatile, and companies shouldn’t feel limited to only placing them in waiting areas. We live in a time when digital printing allows us to mold printed products to meet a variety of promotional needs. Retail stores could consider using talkers on display tables to provide more in-depth information about product ingredients, manufacturing processes, or company background. These even work well for promoting seasonal items. A busy hotel lobby is a good place to use table talkers to generate interest in in-house services and promotions. They can be particularly useful when visitors have to wait in lines to check in at the main desk. Talkers on and around service desks can be another great way to occupy customers, since these counters can often attract long lines. It can give someone something to read while standing and waiting for help. Table talkers can be a smart and creative marketing tool for businesses looking to engage customers in a unique way. With an eye-catching design and interactive elements, they add a fresh ingredient to your promotional strategy. Creating buzz in the community is a goal of every business. With an effective table talker, you’ll be on your way to becoming the talk of the town.